Let’s face it – sometimes wearing heels all day can be painful but stylish wedding wedges are a way to get both height and comfort on your big day. These wedge ideas are fabulous enough for a bride but still comfortable enough to enjoy every last step – from the walk down the aisle to the last dance. Espadrilles are refreshing and youthful, and perfect for a laidback wedding day at the beach or a ceremony in a bohemian setting. These Maris wedges from Vionic feature soft pewter-colored leather with laces at the ankle for support. 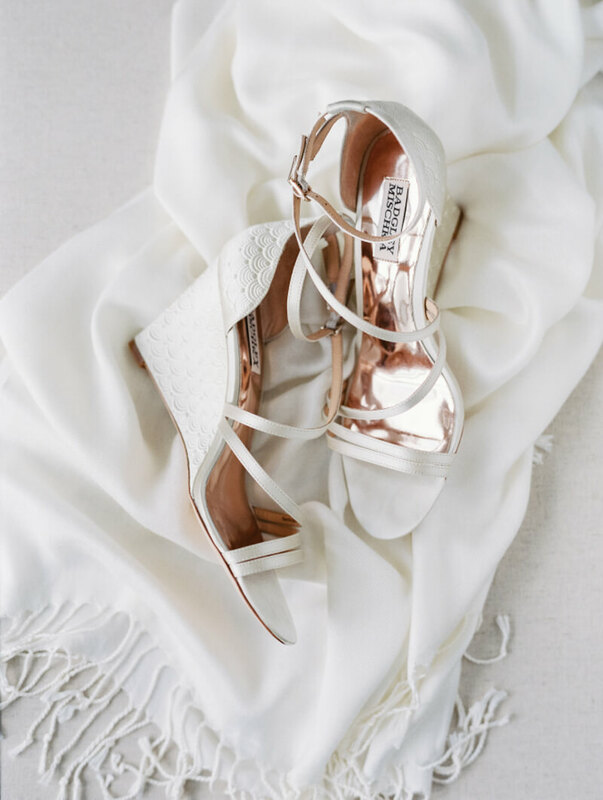 These open-toe wedges feature both white and tan leather straps that scream “bride.” What a fun pair to show off in a high-low skirt as you walk down the aisle. Wedges can be glamorous, too! These gold Badgley Mischka wedges shimmer and shine with chic straps and a beaded embellishment at the toe. For an ultra-pretty alternative, Badgley Mischka also offers all-white wedges with a darling scalloped pattern. They have a modern, swopping strap detail across the foot and support at the toe. And for the bride who wants to make a shoe statement, these glittering gold wedges are the perfect choice. With a modest heel and strap at the ankle, these sparkling shoes can allow you to walk down the aisle and dance the night away in style. Wedding wedges are the right style solution without the aches and pains of heels. And with unlimited styles to choose from these days, every bride can find a pair of wedding-worthy wedges that will keep her on her feet all night long.